Represents a field injected from an anonymous union/struct into the parent scope. Definition at line 2824 of file Decl.h. Definition at line 2844 of file Decl.h. Definition at line 2846 of file Decl.h. 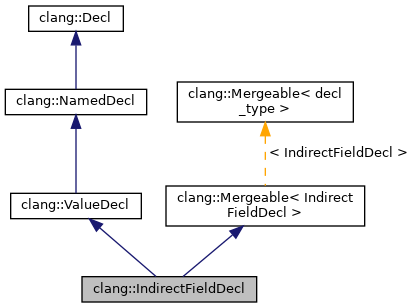 Referenced by EmitLValueForAnyFieldInitialization(), clang::ASTContext::getFieldOffset(), clang::ento::ProgramState::getLValue(), HandleLValueIndirectMember(), clang::ASTDeclWriter::VisitIndirectFieldDecl(), clang::TextNodeDumper::VisitIndirectFieldDecl(), and clang::TemplateDeclInstantiator::VisitVarDecl(). Definition at line 2849 of file Decl.h. Referenced by clang::Sema::BuildAnonymousStructUnionMemberReference(), and ExpandAnonymousFieldDesignator(). Definition at line 2850 of file Decl.h. Definition at line 2868 of file Decl.h. Definition at line 2869 of file Decl.h. Definition at line 4524 of file Decl.cpp. Definition at line 4530 of file Decl.cpp. Definition at line 2854 of file Decl.h. Referenced by clang::CXXCtorInitializer::getAnyMember(), and clang::InitializedEntity::InitializeMember(). Definition at line 2864 of file Decl.h. Definition at line 2865 of file Decl.h. Definition at line 2852 of file Decl.h. 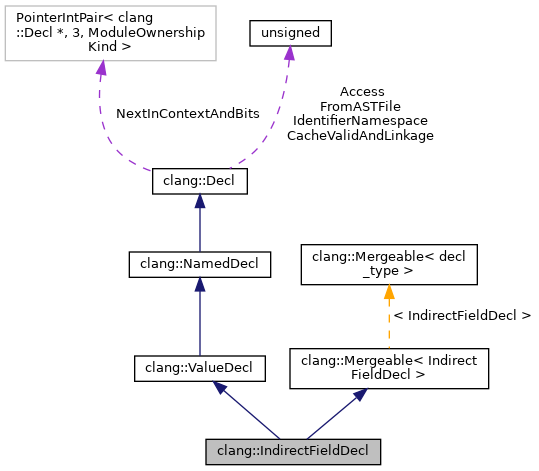 Referenced by clang::ASTDeclWriter::VisitIndirectFieldDecl(), and clang::TemplateDeclInstantiator::VisitVarDecl(). Definition at line 2859 of file Decl.h. Definition at line 2836 of file Decl.h.